This time last year I was making plans to travel up and down the county to attend all the wedding exhibitions taking place...this year however I'm not a bride-to-be anymore so I haven't been doing the rounds. But don't worry, cause where there's a will there's a way and I've been digging around online to find as many photos from all the shows as I can! 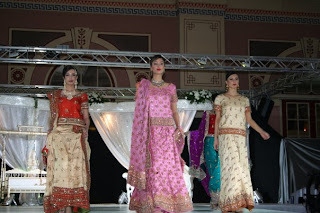 Here are some snaps from the AWE (Asian Wedding Exhibition) which took place last weekend at Alexandra Palace in London. These were posted onto the facebook group for simi hair and beauty who did the make-up for this show. The purple outfit at the front has a very Japanese look about it, with the little collars and the white stripes going across at the front. 3 lenghas, which one would you pick?? I think I'd go for the red and white, on the left. The pink is just too sickly (although ironically, it's the exact same colour as my wedding outfit! minus the gold embroidery), and the one on the far right looks a bit plain. I really wish you could see the bottom of the skirts in these two photos cause from the waist up I'm really liking these looks. Only recently discovered your blog - really enjoying it. Great Pics!! 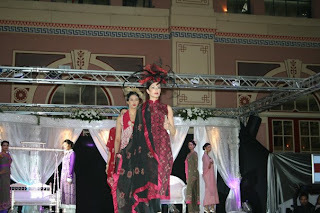 i must say that the collection is awesome..
Back for 2009 - focus on kidswear!